One would recollect the prodigious development in Singapore’s art scene back in the 1950s by catching a glimpse of fishing sampans with a Western composition — the Nanyang style. Now, how do we react to plastic boats and DSLR cameras in the same setting? Fresh Takes, a group show exhibiting the astounding works of eleven young Singaporean artists, sets forth their personal responses to artworks or items selected from Singapore’s National Collection. One of which, is a Nias household deity figure from the Asian Civilisations Museum that Sheryo has whimsically recreated in Singapore’s contemporary context; complete with a pet merlion, palm trees and durians. The red and gold, ‘auspicious’ colours beckon playfully to the viewer, hinting at Chinese notions of prosperity, reminiscent of ‘Door Gods’ that exist as painted elements on doors of Chinese families. The distinguishable quality of Doormaster Ang is greatly attributed to Sheryo’s thorough consideration of the elements of art, and is conducive to the viewer’s understanding of her work. Among the other artists exhibited (Aiman Hakim, Alvin Ong, Esmond Loh, Eugene Soh, Jahan Loh, Jing Hu, Koh Liang Jiang, Ryf Zaini, Yanyun Chen, and Yeo Jian Long), the work that called out to me momentously was Alvin Ong’s In Search of Tanah Airku , 2015 (Oil on Canvas, 125 x 180 cm). 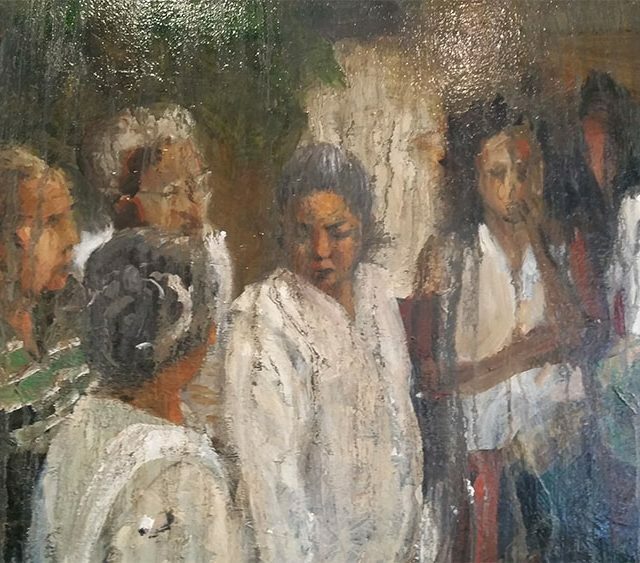 Having familiarity with Chua Mia Tee’s Epic Poem of Malaya, the earthy and crisp white palette in Ong’s work was a bridge between the two, a congruous characteristic. In Search of Tanah Airku features an exhumation where the main figure in Chua’s Epic Poem of Malaya might have stood, a harking back to society in that era, a visual realisation of selective remembrance and a definite revelation of change. The profound perspective into Singaporean society’s evolution to the present day, and his introspection of time is skillfully narrated in Ong’s work to provide a piece that probes into the minds of his viewers and coaxes them to reflect on their surroundings. What about the irrevocable impact of technology on humanity and the world around us? New Third , 2015 (Mixed media and electronics, dimensions variable) by Ryf Zaini seeks expression of the impact of industrialisation by depicting its effect on the quality of production. A idiosyncratic take on Tang Da Wu’s Tiger’s Whip, the majestic perched tiger is now a disquieting plastic flop on the ground. One does not fail to notice that the red fabric has been replaced with an electrical cord that connects to the tiger, hinting that the weaponising of technology to meet our demands has shortchanged the tiger’s life and majesty. The relationship between technology and nature is starkly depicted in New Third , and touches upon the artist’s concern — the omnipotence of humans to manipulate technology to impact and create our world. Of course, one does not miss Esmond Loh’s Farewell, 2014 (Acrylic and oil on canvas, 170 x 130 cm). The viewer’s attention is drawn to the only focal point in the painting — a male figure half submerged in a never-ending ocean, seemingly in cogitation. Loh voids his work of narrative and conclusions, capturing the man in his reverie. Is he rising from underwater? Is he sinking into the vastness beneath him? The intimacy of a person in contemplation about his existence is universal yet personal in Farewell, a poetic musing of the relationship between man and the land he is born on. Seemingly, the only answers to be found in Loh’s work reside in its viewers. We can observe how artists develop their art-making habits through conversing with the works of a different era, and form new perceptions of time as viewers. To look at older works through young eyes, visit Chan Hampe Galleries at #01-21 Raffles Hotel Arcade, 328 North Bridge Road, Singapore 188719 from 11 to 29 March 2015.